Located in the heart of the Delta, Crowley’s Ridge Nature Center is a fun place to discover the story behind the unique beauty found within its landscape. The three-story nature center, built in 2004, sits on 160 acres and includes a 5.5-acre prairie, 2.5-acre pond, and approximately 100 acres in woodlands. Crowley’s Ridge is named after Benjamin Crowley, the first European-American settler known to reach the area and is a prominent feature in the plains of eastern Arkansas. Stretching for 150 miles, the ridge runs from southeastern Missouri to the Mississippi river near Helena, AR. We stopped in for an afternoon of fun and left blown away with the informational adventure they provided! The education complex features an exhibit area, observation tower, meeting rooms, Discovery room, auditorium, gift shop and offices. They offer a 16-minute video presentation several times a day that is not only jam-packed with fun facts but also keeps the audience’s attention with external stimulations. Fans misting water simulate rain, bleachers shake with the earthquakes and lightning, blinding white lights flicker as the lighting strikes within the setting, all drawing the adventurer right into the film. The first stop upon arrival is inside the visitor center. The entire entrance hall is rich with displays featuring the area’s wildlife. There are large maps and charts detailing the history of the Delta. We spent some time browsing the exhibits and reading the graphics before heading out onto the trails. 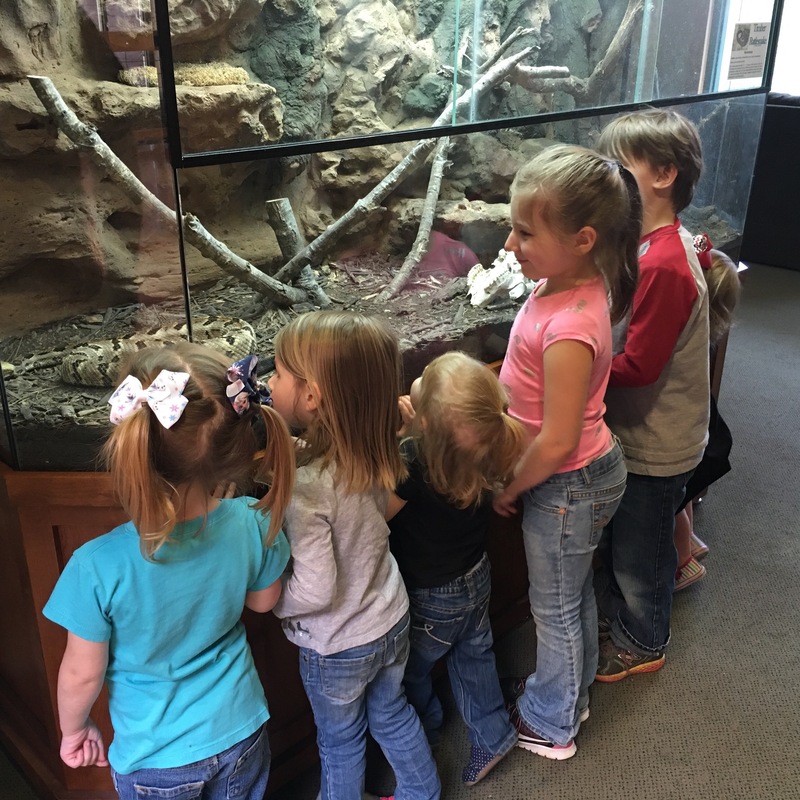 The kids were fascinated by the live fish, snakes, reptiles, and fossils. 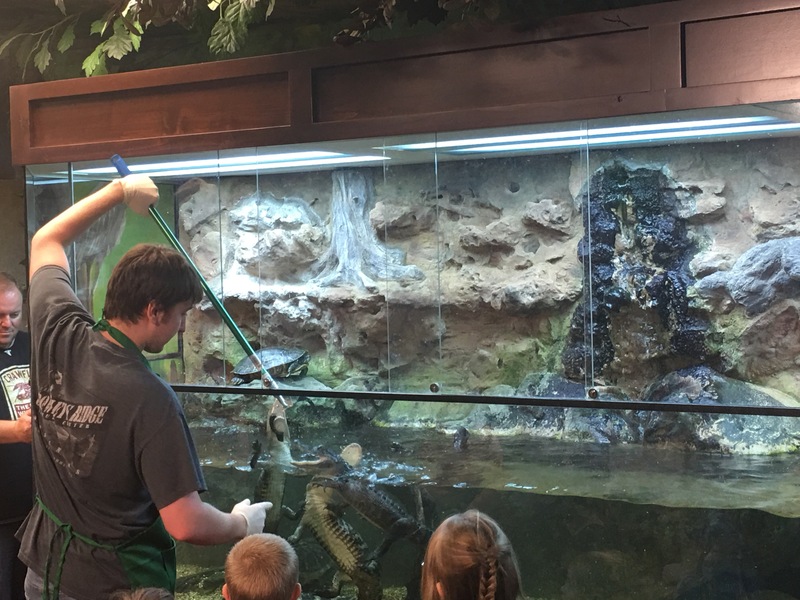 Several of the exhibits were hands on making exploration of the wildlife that much more in-depth for our inquisitive littles. Once outside, we walked down to the waterway where we caught glimpses of sunbathing turtles and protective geese carefully guarding their nest. Being down inside the valley of the ridge was sweet and simple but we were sure the top would be gorgeous and nature definitely provided. The hike to the lookout was fairly easy, even with 8 kids under 7, and was definitely worth the trip. I mean, look at that view. If you ever have the opportunity to swing by Crowley’s Ridge Nature Center, our family highly suggests you do. It is one location that is guaranteed not to disappoint. Have a hard-headed teen who just finds it all lame? Take them in during the alligator feeding time; it’s sure to impress! Closed Monday, Thanksgiving Day, Christmas Eve, Christmas and New Year’s Day. The Arkansas Game and Fish Nature Centers are funded by Amendment 75, the Conservation Sales Tax.